The action-packed guide to start a new blog or kickstart an old one. Thank you to Kiesha Easley and WeBlogBetter for being a Silver Sponsor for the 6th Annual JobMob Guest Blogging Contest. This was the first ebook I've read about blogging in years. The layout is simple, with a style reminiscent of WeBlogBetter itself, easy on the eyes and easy to read. “Each team will be confronted with the difficult task of building a successful blog together. They will receive training and will face many blogging challenges together. The contest spanned 10 weeks, and each had a challenge for the two teams. Similarly, the ebook gives you the same 10 weekly challenges (homework, basically), each one building on the previous, and each one accompanied with the new training needed to accomplish the fresh challenge. I liked how Kiesha showed the potential results of challenges by explaining how the Alexa rank of the leading blog evolved during her contest, but I would have really enjoyed hearing how the contestants struggled (or not) with the challenges themselves. Maybe in a later version. 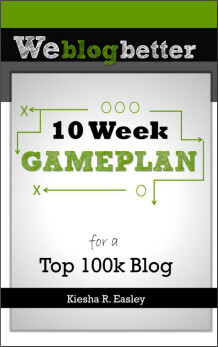 Complete the challenges and you've completed the ebook, up until the last section about how to continue growing your blog beyond the challenges, followed by a handy list of all the links and websites mentioned in the ebook. Overall, the ebook is very down-to-earth, reasonable, clearly speaking from experience and speaking clearly about the experience you'll have to get a well-trafficked blog if you follow Kiesha's steps and strategy, which encourage bloggers to organize in teams for mutual benefit and cross-promotion (hence the name “WeBlogBetter”, right?). That isn't the path I've taken with JobMob, but her arguments are very convincing especially if you want to grow a blog quickly (who doesn't?). Kiesha says the ebook “will be most helpful for people who are just starting a new blog or who have been struggling with building an audience for an existing blog.” (And that's absolutely right, although as an experienced blogger, I was happy to discover some resources and tips that were new for me too.) If you're in one of those two groups of people, this ebook is well worth the money. Thanks again to Kiesha Easley and WeBlogBetter for being a Silver Sponsor for the 6th Annual JobMob Guest Blogging Contest. Subscribe to JobMob via RSS or email and follow me on Twitter for more great contests with great sponsors. I just read this ebook and really enjoyed how practical and helpful the ideas were. It reminded me to use Stumbled Upon and other social networking tools I had forgotten about in my focus on the Facebook, Twitter, Linked In trinity. Next PostA Recruiter’s Dilemma: Should I Add a Smiley or Not?